Students work on manufacturing their final project for Camp Innov@tion. 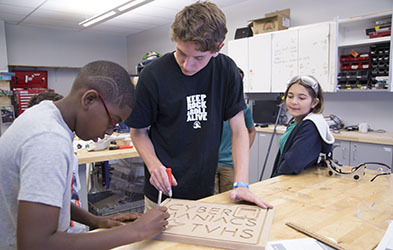 Tech Valley High School hosted more than 40 middle school students for Camp Innov@tion. Throughout the week, students from 25 Capital Region schools discussed strategies and solutions to real-world problems with some of Tech Valley High’s business partners, participated in off-site field work in the Tech Valley region, and learned hands on manufacturing skills to engineer elements of their final presentation. The free week-long experience saw students entering 7th and 8th grades collaborating to solve problems such as breaches in cyber security, preparation and response solutions to natural disasters, and prevention of a global public health crisis. The camp, which was sponsored by Siemens, National Grid, and Nuts, Bolts & Thingamajigs® (NBT), the foundation of the Fabricators & Manufacturers Association, Intl.® ended with students presenting their ideas and solutions at the Museum of Innov@tion and Science (miSci) in Schenectady. Camp Innov@tion is focused on promoting collaborative creativity and advancing innovation through STEM learning. This was the first summer Tech Valley High School offered the camp. To see more of the Camp Innov@tion student experience, visit our Facebook photo gallery.